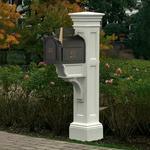 The Statesville Mailbox Post has clean, uncluttered lines and timeless detailing. Simple yet strong, the Statesville Mailbox Post serves as a perfect and warm invitation to retrieve your mail at the end of the drive. 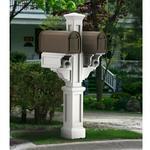 Built by Mayne, the Statesville Mailbox Post meets a series of rigid quality control standards before leaving the factory. 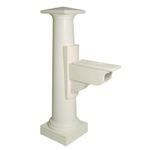 It is constructed of advanced high-grade polyvinyl and polyethylene around structural elements, which results in an arbor that is virtually maintenance free. It won't crack, warp or mildew, and will withstand insects and adverse weather conditions. It's a cinch to install, requiring no special skills - and it doesn't need an annual paint, seal, or stain like arbors made of wood. Beyond that, it's an ecologically friendly choice! 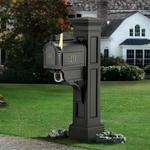 Mailboxes are sold separately. 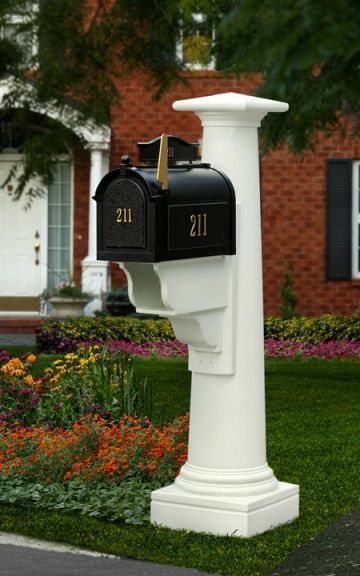 In a mail post market filled with “me too” items, we are proud to offer a new and unique line of products adding character and heart warming charm to your home or business. We want to help you to create your own personal expression with the elegance and style of the East Coast. 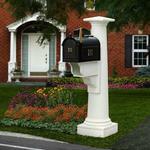 With classic lines and timeless beauty, we are truly offering “Mail Posts Of Distinction”.